A longer timeline gave us an opportunity to consider places we’d usually avoid due to significant travel times. Also, instead of hopping around a lot, we wanted to spend a lot of time in once place. This was a change from how we’d done travel till now but we were looking forward to it, given this is the preferred technique for most seasoned backpackers. 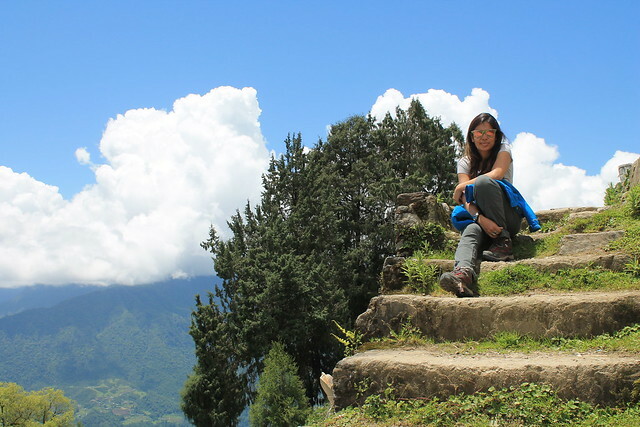 After much deliberation, we decided to spend the first half of June in Tawang, and the second half in Leh. 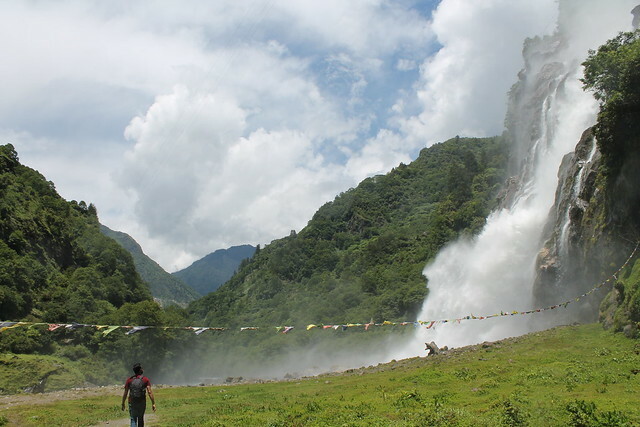 Two day journey from almost anywhere in the country, unless you can book a chopper directly from Guwhati to Tawang. Our objective for day one was to reach Tezpur. We landed in Guwhati and took a five hour bus ride to Tezpur from there. From Tezpur, there were a few options to head to Tawang. Strikes the (almost) right balance between price, time and comfort. Expect the balance to tilt farther away from comfort though. With total of 11 people crammed in one TATA Sumo, this can easy turn out to be one of the longest journeys of your life which will take anywhere from 12 - 14 (or more) hours. It took 13 hours for us to reach Tawang and 14 on our way back. But hey, you get three breaks to do, well, whatever you can to make yourself feel better. Got money to spare? Then look no further and contact one of the many cab operators near Tezpur Bus Station to book a private cab. Yes, that is an option too. Flights are from Guwhati but the timings and schedule depend largely on the weather. 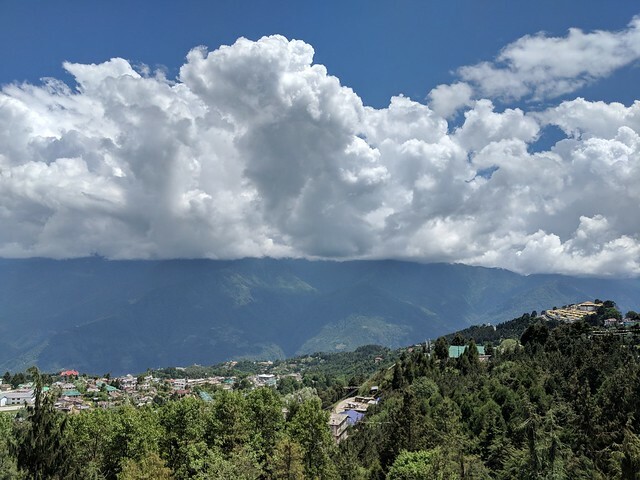 We didn’t know about this while going to Tawang and could not explore this option on our way back because of cancelled flights due to overcast skies. Would love to give it a try though. 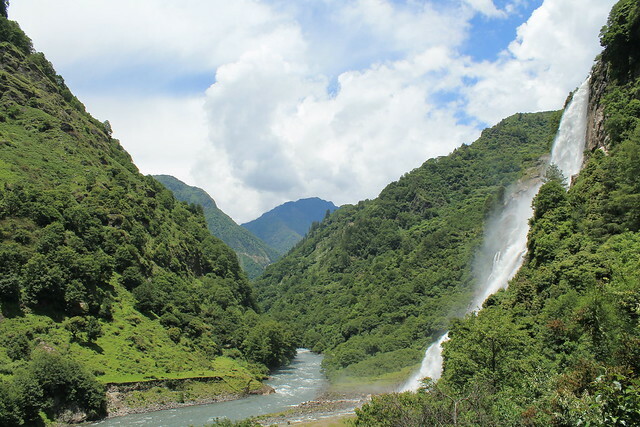 Bookings can be done from Arunachal Pradesh Tourism Website. 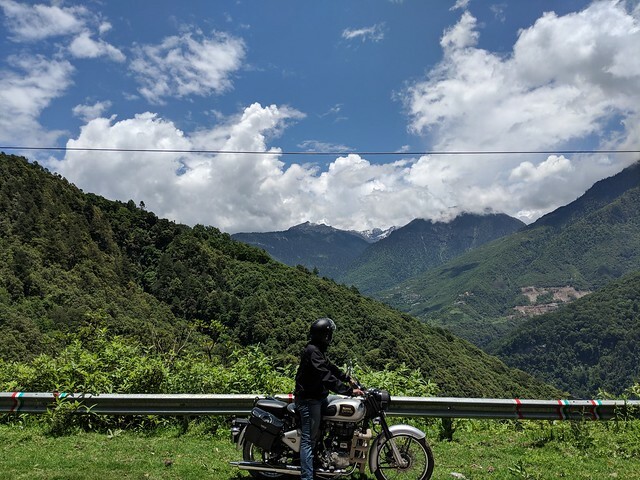 We knew our timing to visit Tawang was somewhat off with a lot riding on our luck. 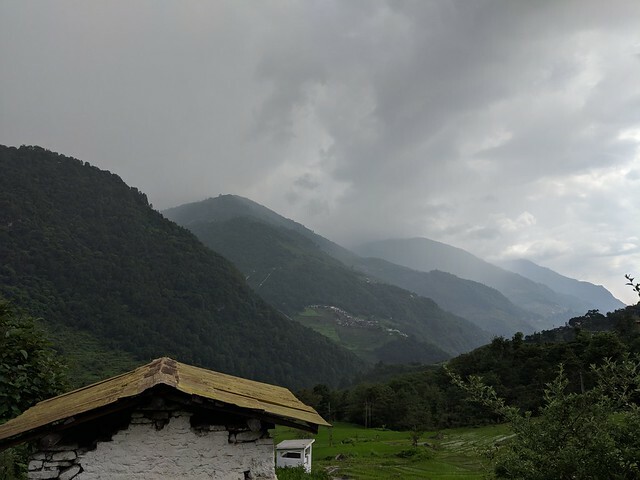 The most popular season to be there is March to May, by the end of which, monsoon looms over the valley for next few months till the onset of winter. The first morning was as good as it gets. 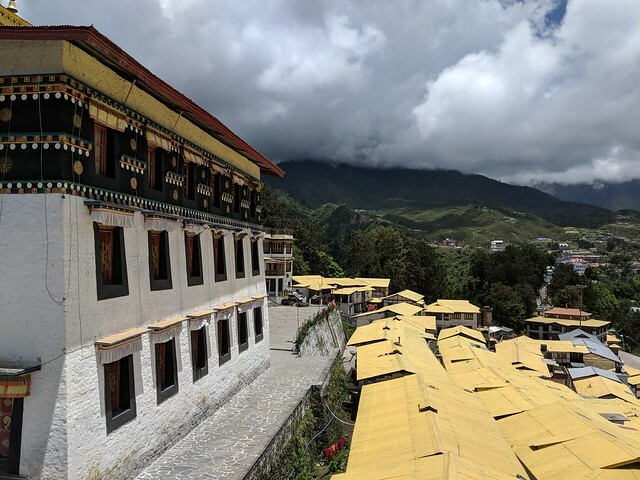 Blue skies with small patches of clouds gliding lazily across the lush green valley at different heights with the bright yellow rooftops of Tawang Monastery in the distant background provided a refreshing view of the beauty of this place. We quickly had breakfast and rushed to the market to rent a motorcycle. We were hoping to get enough recommendations from locals so we didn’t bother too much about doing any research. We found one of the two shops in the market that rented out motorcycles, #myTawang. Actually it was a motorcycle rental shop, a restaurant, gift shop and a hotel, all in one tiny complex. The owner didn’t seem too pleased to see us, probably because we’d woken him up from his early morning stupor. But he became amiable in next few minutes and was sweet enough to suggest places for us to go, with short history lessons about each of them. 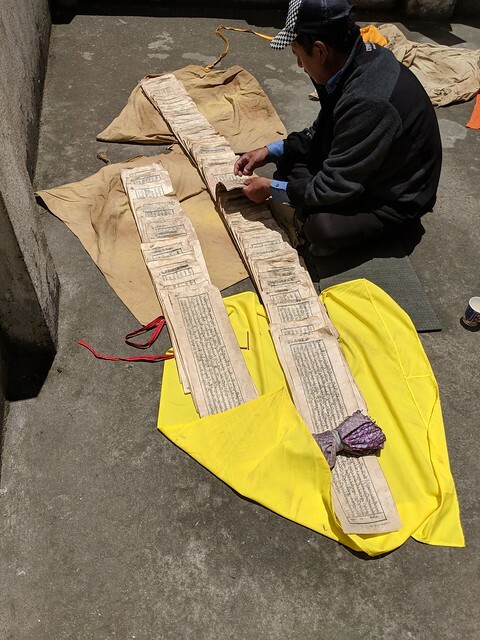 He went as far as drawing a rough map of the preferred routes to take, time of the day to visit, festivals happening across the valley, required permits and how to get them. He suggested a good café to hang out in, once we were done for the day. We figured out later that the café was owned by his cousin. We rented a RE Classic 350. 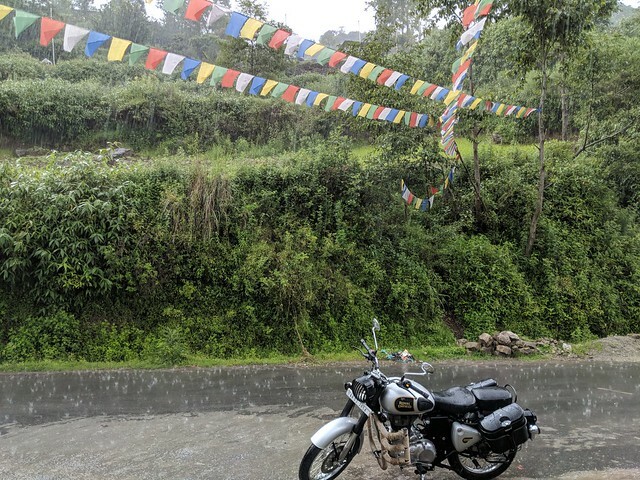 I wanted to try out the Himalayan but was out of luck here since the ones available at this place were already rented out for next few weeks. The trip had just started so I didn’t lose hope. 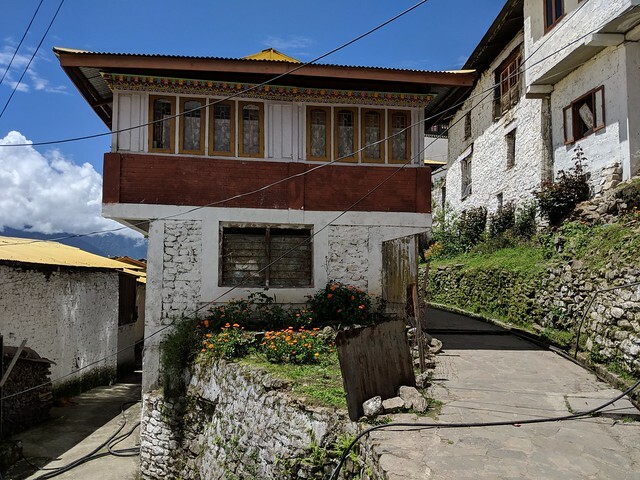 Few things to note about Tawang, from a navigational point of view. Data connectivity is non-existent so come prepared by downloading the map of the region in advance. A lot(most) of places are not marked on the Google Maps, so expect to wander off into wrong directions and ask for help from amused locals. 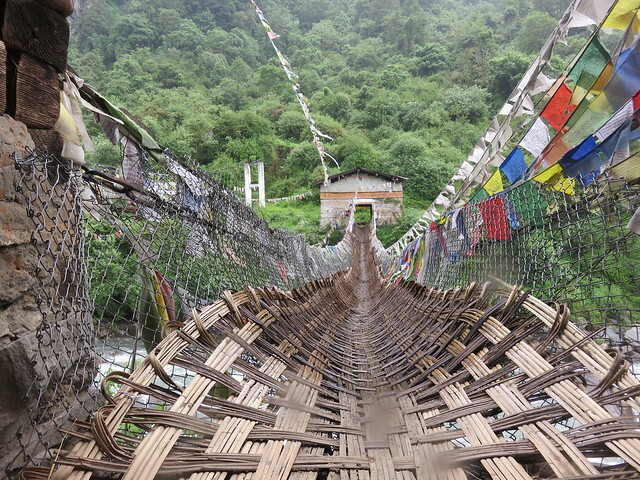 Almost 600 years old, this bridge is one of the many that were built by a monk across the Himalayan range. 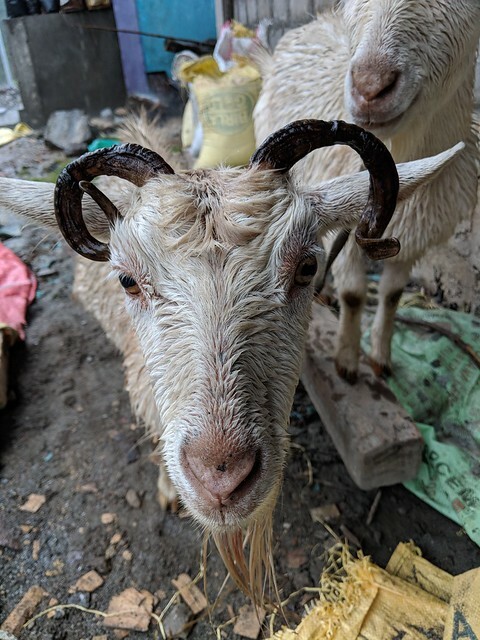 Today, only four of them remain and this is the only one in India. This place is not on Google Maps right now, so here’s the link if you plan to drive down here on your own. We lost our way a few times before eventually reaching here. The weather started to become noticeably warmer as we descended into the valley. 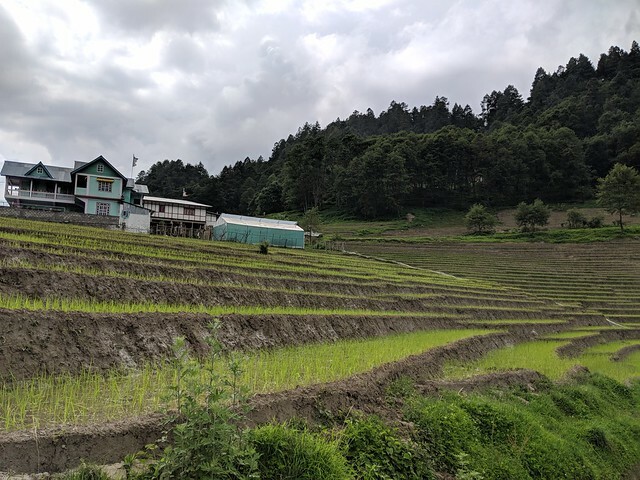 On the way, we crossed a lot stepped paddy fields, colorful houses, men having beer(at 11AM), small streams crossing the road and few kids playing around in the sun. It was textbook picture of a typical Indian mountain village and we were in it. We reached the rather isolated bridge in a few hours with a few stops for pictures. The bridge still stands tall on its old foundations and a set of six iron chains that link the two ends together. The only reinforcement done here seems to be the steel cage that replaces the thatched layer of straw. 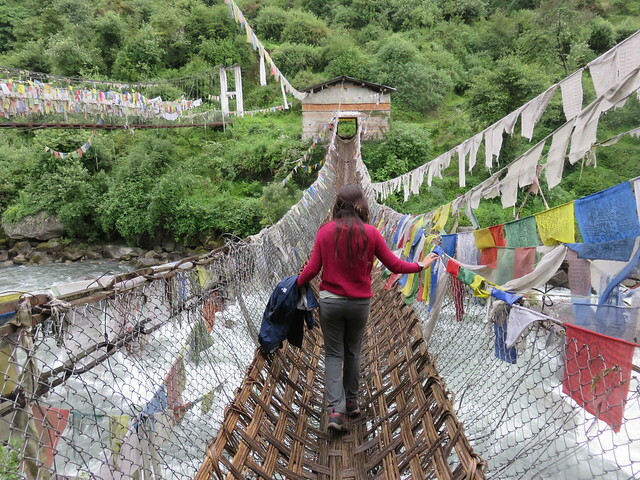 We were skeptical about crossing this at first but decided to brave it out. The bridge on the left is the relatively younger sibling of this, made out of concrete and steel. Bright, new and shiny but not a lot of character. As always, I loved the sight of colorful prayer flags fluttering over the ropes, sending their message out with the strong winds above and waves below. We crossed over to the other side, did a small hike to get a better view of the two bridges. It had started to drizzle by this time and the sun was all but gone. After struggling to set up the cam on rocks and what not, we managed to take one decent picture and rushed to get to the bike. If you look closely enough in the picture below, you’ll be able to see the motorcycle parked on the opposite side of the river. By the time we were on the bike, it had started raining quite heavily. It was only 2.30 PM and we’d planned to visit one more place that day. We waited for 15 minutes before giving up any hope of surviving the rain. Two hour later and completely drenched, we were back to base. I remembered how much I hate riding in the rain and why. We decided to leave even earlier the next time to avoid this situation. Close to the small town of Jang, Nuranang Falls are pretty much on the highway which means decent roads for the most part. 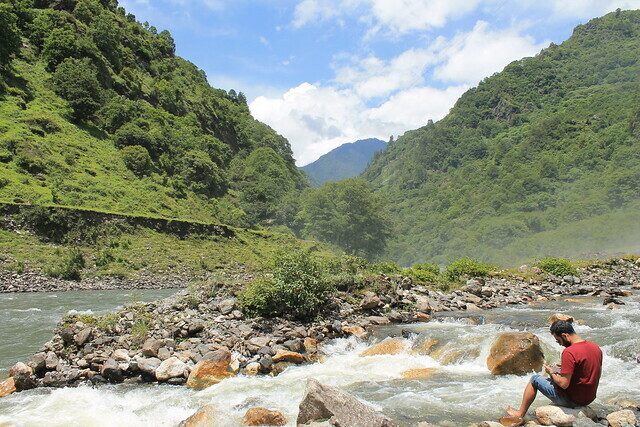 A small, dirt road branches off from the highway, about 2 KM before Jang and leads to a hydel power plant. From there, the falls are 10 minutes walk away. We left quite early so that we could make it back in time. The morning was as glorious as the previous day. 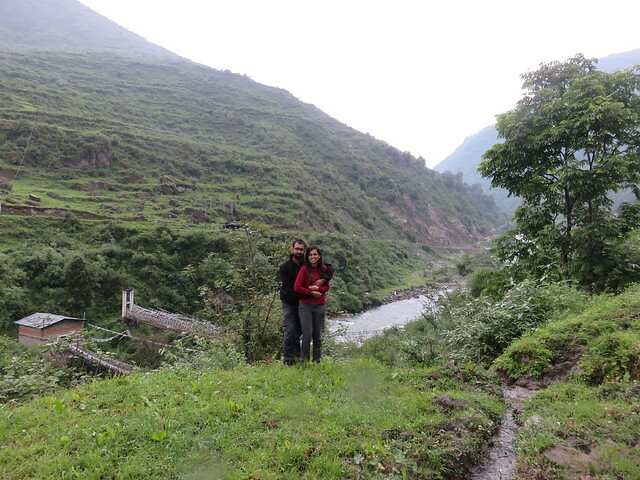 Since most of the route from Tawang to Nuranang Falls is on the highway, we had a pretty smooth ride all along. Other than a few stops to click pictures, we didn’t halt. 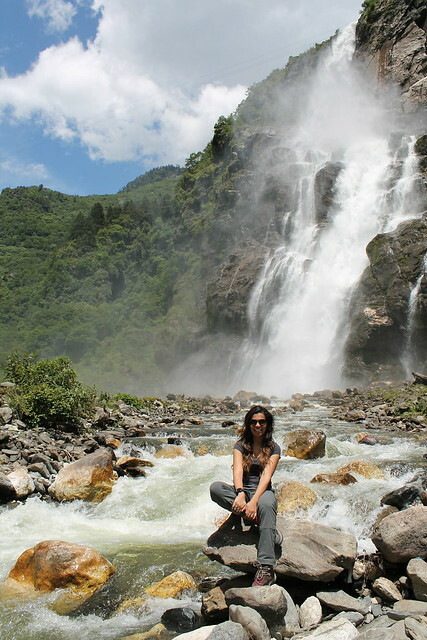 We reached the hydel plant in about an hour and started walking towards the falls. About 10 minutes later, we were at the base of the falls. A fine mist shower greeted us as we started getting close. Now the first thing that stuck us after we were done admiring the waterfall was the garbage strewn across the length and breadth of that area. The entire experience was as jarring as it can possible be on the senses. Ironically, it was the World Environment Day and folks in the towns barely a few minutes from the waterfall were busy in conducting cleaning drives. This place seemed like a picnic spot that everyone used but no one cleaned. We picked up a few large plastic bags, also lying around, and in a short time were able to gather a huge pile of junk. We started talking to a few curious locals who were just setting up camp for the day with a huge cauldron to cook meat and few crates of beer. 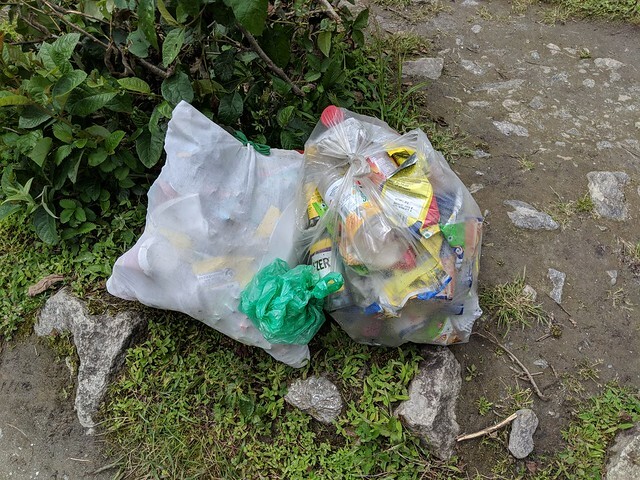 They seemed to share the concern for the environment and importance of keeping plastic out of the mountains but were quick enough to blame almost all the problems on the tourists. After a short chat, we moved on to relax for a while and enjoy the cold, fresh water. We started heading up the trail after an hour. We needed to start early if we wanted to have lunch and still make it back on time. Found a small, rather deserted, restaurant a few minutes ride from the waterfall. A modest lunch there ended up taking more than an hour, probably the owner was surprised to see any customers on a weekday and started the kitchen just for us. It was 3 PM and the ominous clouds suddenly appeared out of nowhere. Started to drizzle and a few minutes later, heavy rains. We had to take shelter five times at various places before finally making it back to the guest house. By end of the day, we were drenched again and running out of clothes and shoes to sustain us for the rest of the trip. 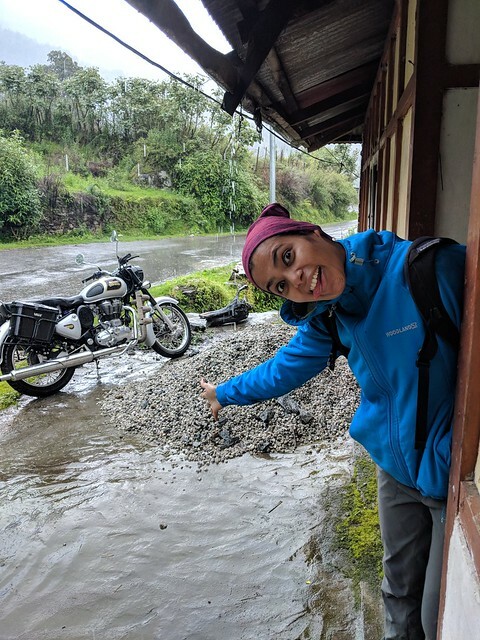 We started giving some serious thought now about these bike trips. We decided to take things at a slower pace from then onwards. We were, after all, on a vacation. There were only two recommended things to do in Tawang itself, the Tawang Monastery and the War Memorial. We got another recommendation from our friend there to visit the fairly new Nature Interpretation Center. With this short list, we headed out on a happy, sunny day. 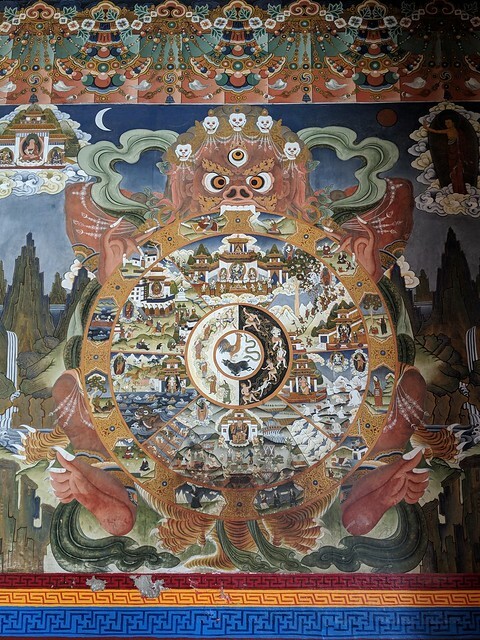 Since Wikipedia can provide a better description of Tawang Monastery, I’ll skip those details. 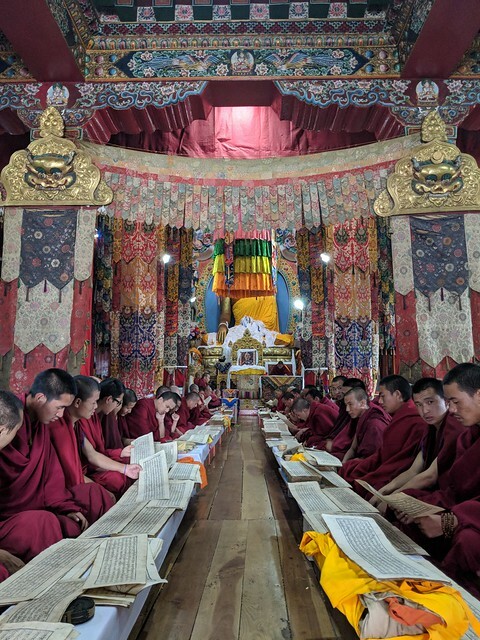 Do take some time to go through the fascinating history of the second largest monastery in the world, and largest in India. We’d earlier made an over-ambitious plan to attend the morning prayers here, at 5 AM. We reached there at around 10 AM. The prayers were still going on inside the main hall of the monastery, but these were different from the morning ones, supposedly. Since we didn’t know any better, we just assumed this was what everyone was talking about. The hall was full on monks and locals who were reciting the verses from scriptures in unison. The top half of the giant Buddha statue is covered by the flags in the picture above. I decided to go in and walk around to look at the colorful and intricate murals that depicted stories of Buddhism and its torch bearers. The chanting was providing a pretty amazing background score while I immersed myself in the detailed designs and caricatures. I think I spent a lot of time there but didn’t take a lot of pictures though. It seemed futile because nothing could actually capture the experience of being there. One of the reasons we travel, isn’t it! I came out after a while and we roamed around for a while across the huge campus. There’s a pretty big library too. We spent a lot of time observing people engrossed in all sorts of activities, from filling up the butter lamps for the evening prayers, drying out the scriptures, cleaning, talking, sun bathing and staring at clueless tourists like us but giving a warm smiles in return. 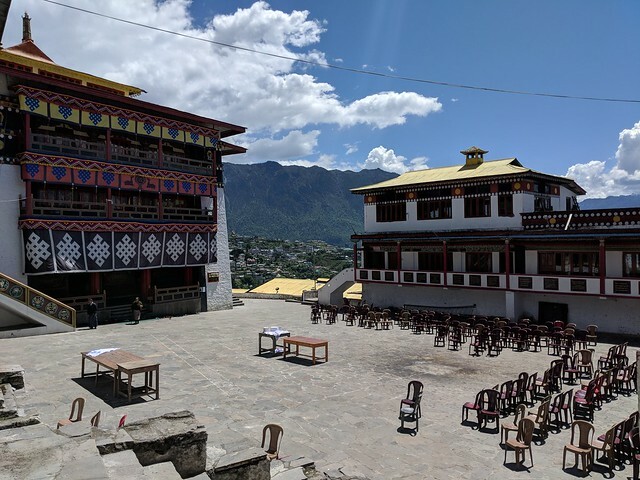 The campus, as expected, was huge with a lot of smaller prayer halls, a museum, living quarters for monks, library, terraces, walls with prayer wheels and gift shops. Since we were there in the middle of the day on a weekday, it felt like we had the place to ourselves. We clicked a few pics, sat in the sun discussing something I can’t recall and were off to check out the Nature Interpretation Center(NIC). 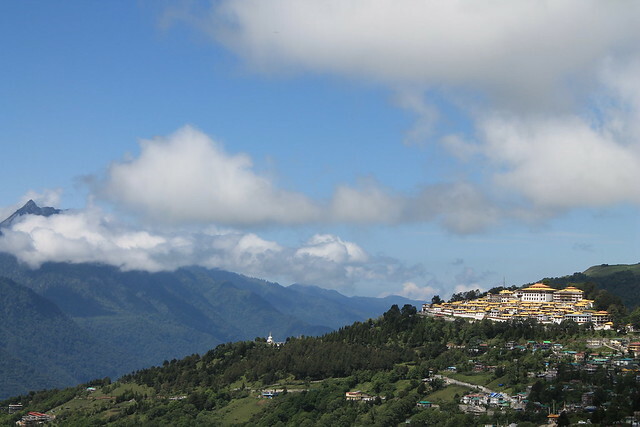 The monastery is located at such an amazing spot that it is visible from practically everywhere in Tawang. The NIC was located at one of the highest points of the town with gorgeous views of the valley. We learnt a lot about the surrounding ecosystem, the flora and fauna, interesting bits about agricultural practices and, sadly, how mindless deforestation, pollution and poaching is slowly destroying everything that makes this place great. With some lessons in environment conservation, we headed out for the War Memorial. The memorial stands as a reminder of Indo-China war of 1962 with the names of all 2481 martyrs engraved on the memorial walls. There’s a daily light show that happens at around 5 PM which we wanted to watch. The show depicts one of the fiercest battles that took place during the conflict and commemorates the gallantry of Indian soldiers. By the time we reached here, it had started to drizzle and I wanted to kill myself rather than getting drenched again while riding back. Temperature had dropped quite rapidly and by the time we got seated, it was dark and pouring pretty heavily. Contrary to my expectations, the downpour had not stopped by the time the show ended and once again, for the third day in a row, we had to ride back in the rain. Needless to say, we were cursing our luck incessantly while trying to find ways of avoiding the same situation again. I did not expect this post become so long which is a good indication to conclude it. I’ll cover the second half of our trip in a separate post. PS: Please try carry non-plastic water bottles when travelling to Tawang, or any other hill stations in the country. 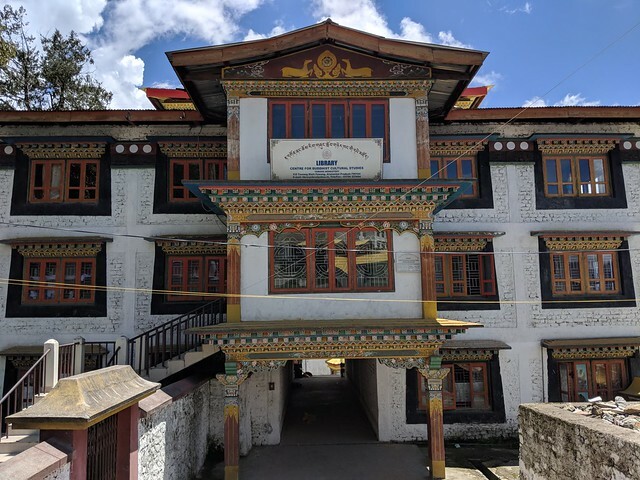 Upon talking with one of the senior Government official here, we found out there there are no waste management facilities in Tawang and almost all plastic is thrown in a pit and burnt by pouring kerosene on it. Aluminium bottles are cheap, easily available and will go farther to help the environment than you can think. I feel proud to say that in our stay of about 13 days here, we did not use even a single plastic bottle and carried most of our non-decomposable trash back to the plains.